TronPixel is a blockchain drawing game based on the TRON network, where you can be creative and build an interesting artwork as a community. Once the work is completed, it will be stored on the blockchain forever and become part of blockchain history. TronPixel is played with a canvas of 1000 by 1000 pixels where users can purchase individual pixels to fill with different colors to add to the masterpiece. Initially pixels with a price of 10TRX, All funds used for the purchasing of pixels will be added to the reward pool. At the same time, the bidder will receive a certain equity value. In order to buy pixels you can either use a wallet on your computer (such as TronPay or TronLink) and a Tron account or an app-wallet on your mobile phone Math Wallet (mathwallet.org). How does bidding on pixels work? The price of buying pixels that are already owned by someone else is 130% of the previous price. The previous owner gets 120% of their initial buying price (so 92% of the new price) and the remaining 10% or the original price (8% of the new price) is added to the reward pool. In addition to owning the pixel, the bidders also earn a certain equity value. How is the reward pool allocated? First of all, 60% of the reward pool will be shared to the equity holders (pixel buyers). 20% will be added to the grand jackpot .The final 20% will be profit of the FUN platform, so the FUN token holders will receive this profit as dividends. How to get the equity value? The allocation of funds in the rewards pool is affected by the purchasing of pixels, purchases will only increase the reward pool, which can’t become lower. As mentioned the purchase of a pixel will grant equity value, the TRX awarded for this will enter the buyer’s personal account from where the player can withdraw their gained TRX. When is the reward pool activated? The reward pool will accumulate funds until 100,000 pixels are purchased. After this formal activation, real-time fund allocation will be based on information such as the current equity value. How to get a referral reward? Pay in to the game will result in a referral link, 0.5% the cost of any referral will be paid to the referrer without additional conditions. How is the grand prize pool produced? After the game is officially activated, the game ends if the total pixel value does not increase by more than 1% in one day (UTC time). The prize pool will be paid out to the player three days after the game ends. The reason for the three days delay is that the Grand Prize Pool will be a supplement to the game's staked resources and will take three days to unstake. What is a free ticket and a milestone hit? Every 1000th pixel that is purchased (so number 1000, 2000, 3000….10000, 11000…..51000, 52000 etc.) will be for free: the bidder who purchases the pixel will receive the same compensation as the purchase cost. The buyer will receive twice the amount of money that should have been received, in total of 240% of the original price. The subsidy funds are paid from the Grand Prize Pool. Since this game is the first indie game of TRONFUN.IO, the platform will provide 10 million FUN tokens as a reward. At the end of the first round of the game, the players who hold the top ten total pixel value are awarded 1 million FUN each. 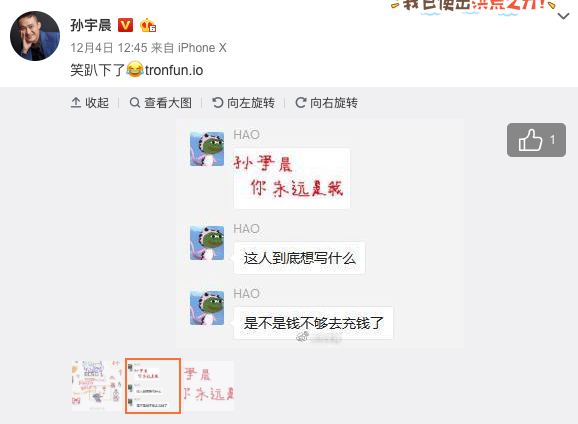 Create TRX wallet in MathWallet, find the DAPP in 【DAPP】-【TronFun】.